The knee is an important joint and it bears the total weight of the body. It is the most common joint that gets worn out when people become aged. Hemophilia, rheumatoid arthritis, osteoarthritis, and patients with gout may also need a knee replacement surgery as these diseases severely affect the joints. It is necessary to go in for Knee Replacement Surgery when the knee joints are totally damaged. Generally, prosthesis is used as an alternate for the knee joint, depending on the cost involved and the patient’s condition. The life of the replaced knee will be about twenty years whereas the life of the artificial knee depends totally on the patient’s activity. There are two Types of Knee Replacement such as Partial Knee Replacement (Unicondylar) and Total Knee Replacement. Partial Knee Replacement (Unicondylar): The worn out knee part is replaced. There are three compartments for a knee. Medial compartment (inside of the knee), lateral compartment (outer part of the knee) and patellofemoral compartment (front portion of the knee between the thighbone and kneecap). Even when any single compartment is worn out, this surgery is performed. Total Knee Replacement: This joint arthroplasty is performed when all the compartments of the knee are totally affected. It is the most commonly done surgery that yields good results. Patients who suffer from the above conditions are ideal for joint arthroplasty. A complete pre-operative evaluation will be done before the surgery especially for heart, hypertension, lung and UTI infection, and people with diabetes. Numerous implants such as titanium alloys, zirconium alloys, oxonium implants, cobalt chromium alloys, and stainless steel are available for knee joint replacement surgeries. Such prosthetics are available in different designs with easier rotation to increase knee bending. Implant selection depends on the patient’s knee condition and the monetary status. The stages involved in the knee replacement surgery are pre-operative, intraoperative, postoperative, and home care. Generally, the patients will be discharged within 7-10 days of the procedure. The pre-operative session involves conducting thorough investigations such as blood tests, X-Ray, ECG, Echo, and Gynecological, cardiological and aesthetical interactions. Patient counseling will also be done. Intra-operative Session: Patients will be taken to the operation stomach in an empty stomach. The surgery will last for two hours. Either epidural or general anesthesia is given to the patient based on their health conditions and the region below the waist is numbed. Quadriceps muscles are detached from the knee cap. The leg and thigh bones will be exposed by displacing the kneecap to one side. The ends of the bones are cut and the necessary cartilages and ligaments are removed. With a cementing material, the prosthesis is wedged on the bone. The stitches are made on the open wound. Post-operative Session: The patient is provided with a knee brace and is advised to intake normal food along with the medicines prescribed by the surgeon. The blood is drained and the wound is dressed. Physiotherapy and knee bending exercises are taught to the patient. Once the patient starts to mobilize, they will be discharged. Home Care: Caring for the wound is quite important. Physiotherapy will be given to the patient for 10 days, at home. The dressing should not be disturbed and should remain water-free. After 5 days dressing will be done and sutures will be removed after 10-12 days. Restricted day-to-day activities such as walking, climbing stairs, etc. 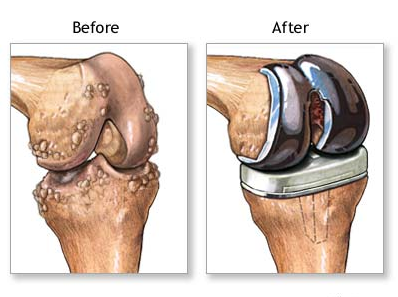 Knee Replacement Surgery in Chennai.